Honda Malaysia celebrated a historical milestone today with the production of the 600,000th unit in its local plant in Pegoh, Malacca. In the same event, Honda Malaysia also took delight in its 100,000 sales units achievement for the current financial year (1 April 2016 – 31 March 2017) despite the challenging market situation over the past year. These achievements mark a successful and strong first quarter of 2017 for the company which is renowned for its challenging spirit and setting the benchmark in the industry. 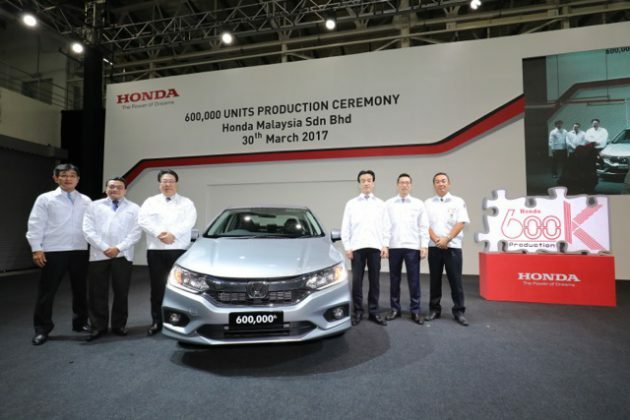 The 600,000th unit production was achieved within a span of 14 years since Honda Malaysia started local assembly in its local plant in Pegoh, Malacca. Currently, Honda Malaysia has two production lines in this plant, the No.1 Line which started operations in 2003 and the No.2 Line that began operations in 2014. Today, Honda Malaysia’s No.1 and No.2 Lines produce seven models to cater to wider customer needs as compared to when it first started with just four models, the CR-V, City, Civic and Accord. Currently the Accord, City, Civic, CR-V, Jazz, HR-V and BR-V are locally assembled at the Pegoh plant. Equipped with advanced technologies, the Pegoh plant was built with flexible production capacity that can produce multiple models at the same time in order to meet market demand. 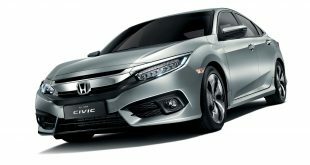 These specially designed production lines and strategic planning have enabled Honda Malaysia to shorten the waiting period for customers when there is a surge in the bookings for certain models. For example, the waiting period for the BR-V is only one to two months despite the bookings being close to 10,000 units, which is 12 times of its monthly sales target. In fact, the waiting period for all Honda models is now just one to two months on average. Some of the latest technologies applied in the plant include the automated Smart Welding Machine to produce high rigidity body frame utilizing high quality material as well as the international standard painting facility comprising Spray Robots and Under Body Coating which improve the quality of body paint and ensure precise coating thickness. Meanwhile, the custom-built 2.1km Test Course puts every vehicle that comes out of the production line through rigorous testing to check that it passes the quality and standard, benchmarking the Malaysian roads. Honda Malaysia spares no effort to ensure that only vehicles that are of the highest global quality standard bear the Honda logo. These achievements and hard work of its 100% local associates are indeed the pride of Honda Malaysia. Also present to witness the momentous milestone occasion were Mr. Seiji Kuraishi, the Executive Vice President, Executive Officer and Representative Director of Honda Motor Co., Ltd. and Mr. Noriaki Abe, Chief Operating Officer, Regional Operations (Asia & Oceania) of Honda Motor Co., Ltd. and President and CEO of Asian Honda Motor Co., Ltd. Both Mr. Kuraishi and Mr. Abe look forward to more accomplishments by Honda Malaysia. Mr. Kuraishi who was the second Honda Malaysia Managing Director and Chief Executive Officer in 2002 to 2005 was appreciative of Honda Malaysia’s contribution. He said that Honda Malaysia’s growth is due to the efforts and understanding of Honda’s philosophy, vision and way of thinking by the local associates. Mr. Kuraishi noted that some of the young associates whom he hired over 10 years ago are now managing the company by playing important roles with passion. He commended Honda Malaysia for attaining No.1 in Non-National segment and No.2 in overall TIV and expressed gratitude to all Honda dealers and sales associates. He was very pleased that Honda Malaysia took top spot as the country that achieved the highest market share among Honda automobile operations globally for the first 2 months of 2017. 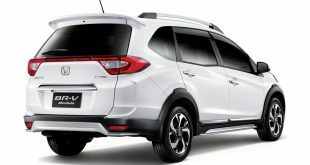 Earlier this year, Honda Malaysia introduced the All-New BR-V, a model that was developed in Asia exclusively for Asian countries. Since its introduction in January, Honda Malaysia has achieved almost 10,000 booking units and more than 5,200 registrations. The launch of New City on 2 March also received positive feedback from customers, with close to 3,000 units booked within a month of its launch, 50% more than the monthly target of 2,000 units. 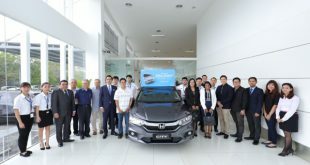 The 600,000th vehicle that rolled out of the No.2 Line at the Pegoh plant was a New City, a significant and cornerstone model to Honda Malaysia. The City is an important model, being the largest sales contributor courtesy of its outstanding reception and warm welcome by Malaysians that made it the B-segment leader for two years in a row.